Under each graph is a "Take snapshot" button. Clicking on this saves a snapshot of the current view of the graph. See Snapshots. All of the time-related graphs have a "Hide legend" checkbox at the bottom. This can be used to reveal any parts of the graph which are obscured by the legend. Some graphs have options to show or hide the upstream or downstream data. This can help clarity when the two plots overlap. All of the graphs which have Time or Tone number on the horizontal axis can be scrolled to the left or right in order to display different time ranges or tone ranges. The graphs can be scrolled by dragging with the mouse or by operating the scrollwheel. Moving the scrollwheel down displays earlier times or a lower range of tones, and moving it up displays later times or a higher range of tones. When the next sample is processed, the time related graphs return to their normal position showing the current time. If you wish, you can inhibit this by temporarily pausing the recording. The graphs automatically rescale themselves in the vertical direction, to accommodate the range of values which have been plotted. Some of the time-related graphs have a "Clipping level" control at the bottom. This sets a maximum level to which the graph will rescale when very high values are received. This enables you to see in more detail any smaller plotted values which might otherwise shrink too much after the rescaling. These graphs plot their values at regular time intervals (30 seconds by default). Separate plots are shown for upstream and downstream values. As new values are plotted, the display scrolls to the left as necessary so that the current time is always shown. The SNR margin graph has the additional option to manually select the scaling of the Y axis. Uncheck the option "Autoscale Y axis" and set the Max and Min values as you wish. If you right-click on the SNR margin graph, a box pops up showing the maximum and minimum values of SNR margin which have been recorded, and the most recent times when they occurred. Beside each line is a 'Go' button, and clicking on this scrolls the graph to show that event in the middle of the display. When the next sample is processed, the graph reverts to its normal position. 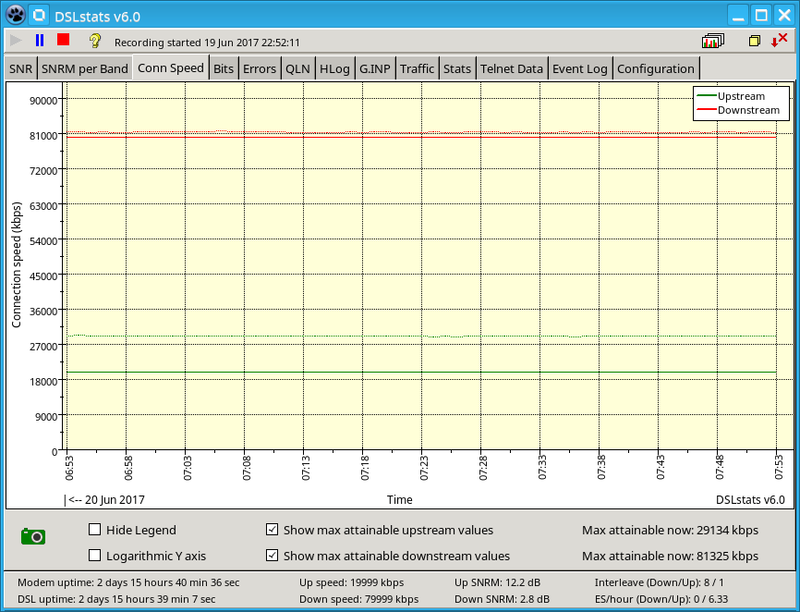 On the Connection speed graph, the maximum attainable speeds as reported by the router are also plotted, in dotted lines (or thinner solid lines if the graph line thickness is greater than 1). These plotted values can optionally be hidden. 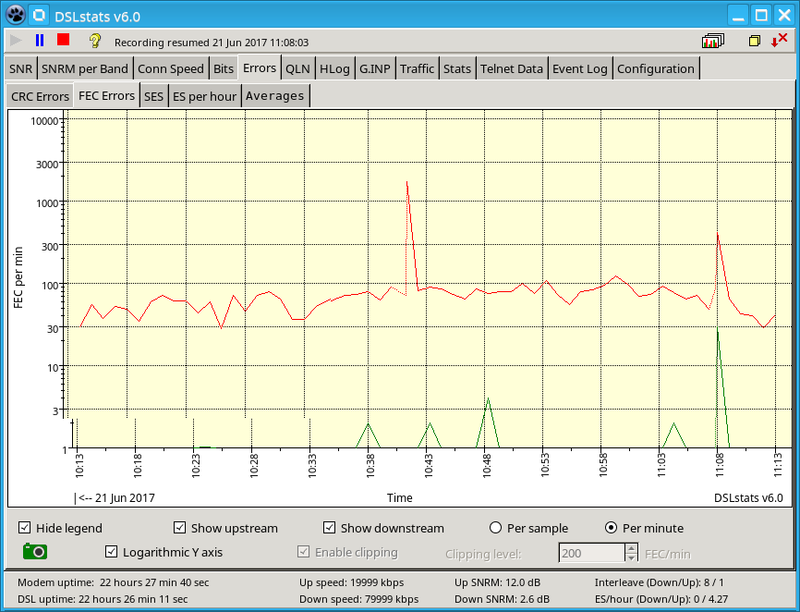 These graphs behave in a similar way to the SNR Margin graph described above, except that the data is plotted separately for each VDSL2 band which is in use. 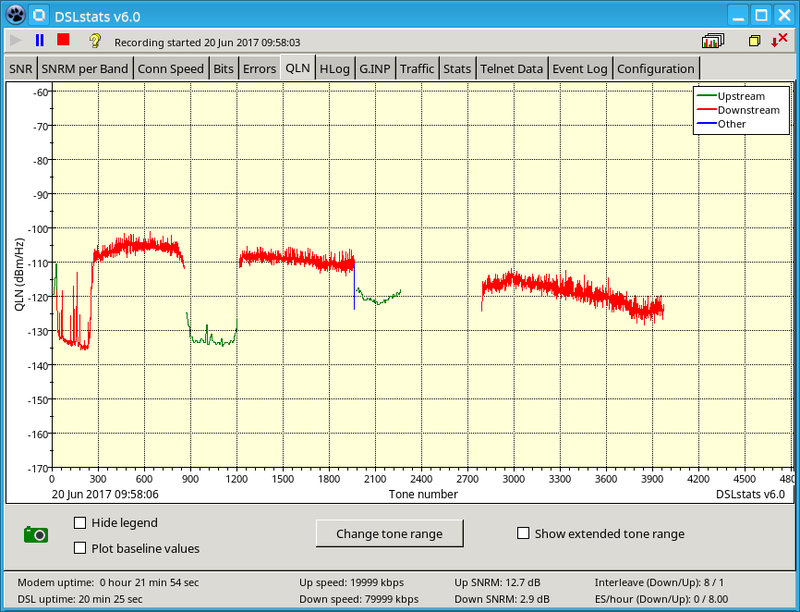 After a recording session starts, the first two samples are used to determine which bands are in use, and to adjust the graph parameters accordingly. Checkboxes below the graphs allow you to display or hide each band, so you can see them more clearly when they overlap. 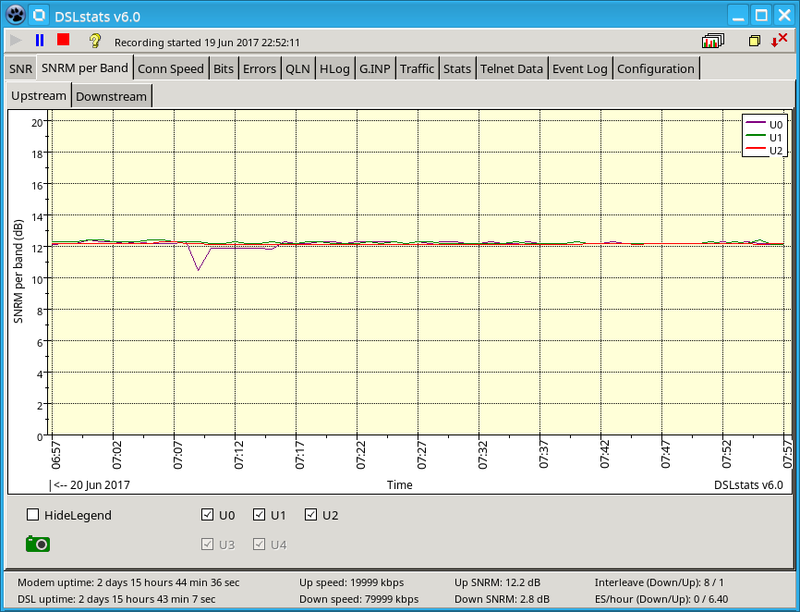 If you right-click on either the upstream or downstream SNRM per band graph, a box pops up showing the highest and lowest values of SNRM which have been recorded for each used band, together with the most recent times when they occurred. 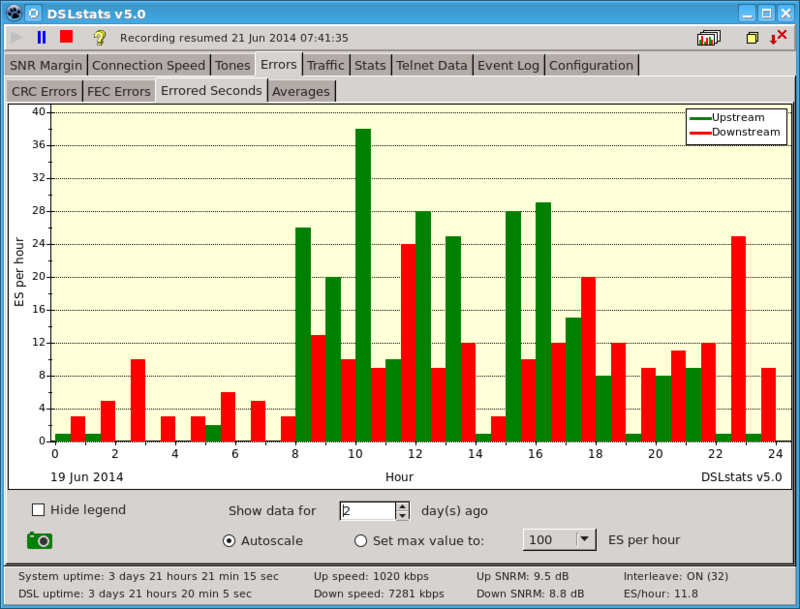 Beside each value is a 'Go' button which scrolls the graph so that the event is in the middle of the display. When the next sample is processed, the graphs return to their normal positions. This graph shows the number of bits currently allocated to each tone, with the upstream and downstream portions shown in different colours. It can also optionally show the SNR per tone values (as seen above). The horizontal scale can be changed by moving the slider towards "Compress" or "Expand". Some routers fail to report the full tone range from time to time. If this happens, and the graph already contains data beyond the latest reported range, the extra data will be retained but drawn in dotted lines. If you right-click on one of the tones, its details will be copied into the box below the graph. Right-click below the graph to erase the details. 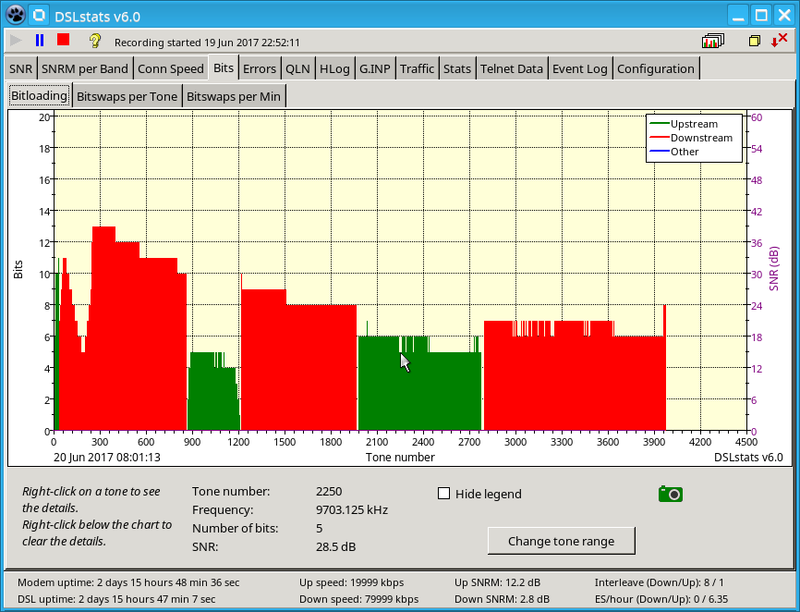 Two views of bitswapping can be seen, bitswaps per tone (seen above) and total bitswaps per minute (not available with Thomson/Technicolor modems). The bitswaps per tone graph doesn't display totally accurate data, but over time it does give a good indication of which tones are most involved in bitswapping. The horizontal scale of the bitswaps per tone graph can be changed by moving the slider towards "Compress" or "Expand". This graph can be reset at any time by pressing the "Reset graph" button, which will restore all the displayed values to zero and reset the Start time indication to the time when the button was pressed. These graphs behave in the same way as the SNR margin and connection speed graphs. You can choose to plot errors per-sample or per-minute. The per-minute values are obtained by taking the number of errors since the previous sample, and converting it to a per-minute value based on the length of time since the previous sample. The graphs include the additional option of having the vertical axis use linear or logarithmic scaling. When logarithmic scaling is selected, the clipping options are disabled. This barchart displays the number of errored seconds (upstream and downstream) in each hour of the day. Up to 100 days of data are stored, and you can view the data for earlier days by selecting a number of days ago in the box. The date which is currently on view is shown at the bottom left of the chart. These values can optionally be plotted on a separate graph or included in the bitloading graph (or both). When shown as a separate graph, the upstream and downstream tones are displayed in different colours. The horizontal scale can be changed by moving the slider towards "Compress" or "Expand". These values are not continuously monitored by the modem, but are only determined at the time of establishing the DSL connection. Therefore the graphs don't change between reconnections. The behaviour of these graphs is the same as the SNR per tone graph. The horizontal scale can be changed by moving the slider towards "Compress" or "Expand". The QLN graph has an extra option "Show extended tone range". This option applies only to VDSL2 connections. 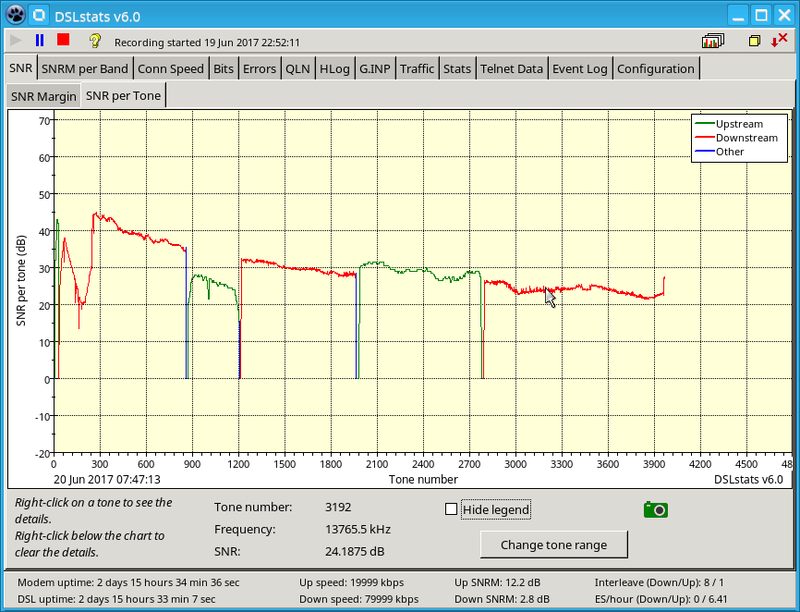 When enabled, the graph shows all the QLN data available from the modem up to tone 4095. When not enabled, only the used tone range is included. 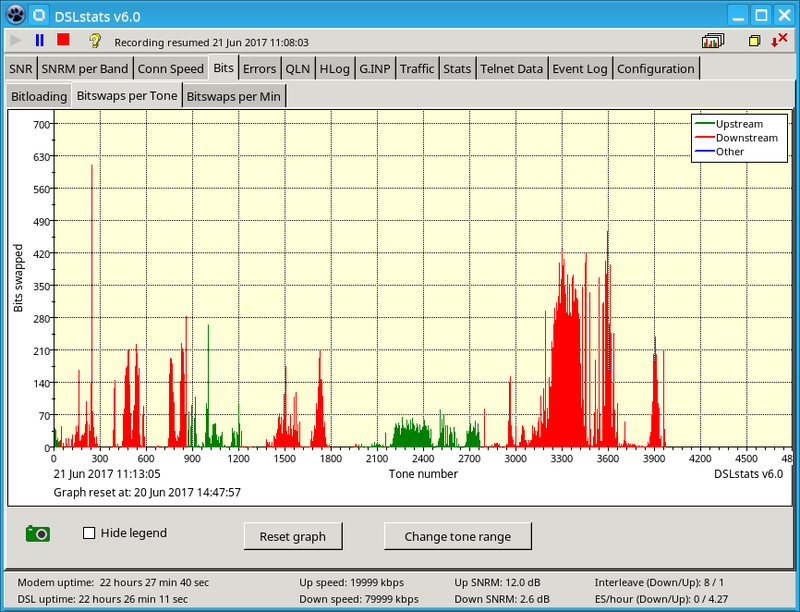 The option "Plot baseline values" plots in dotted lines the parts of the graph which are normally hidden because the tones are not in the band plan and baseline values are reported by the modem. 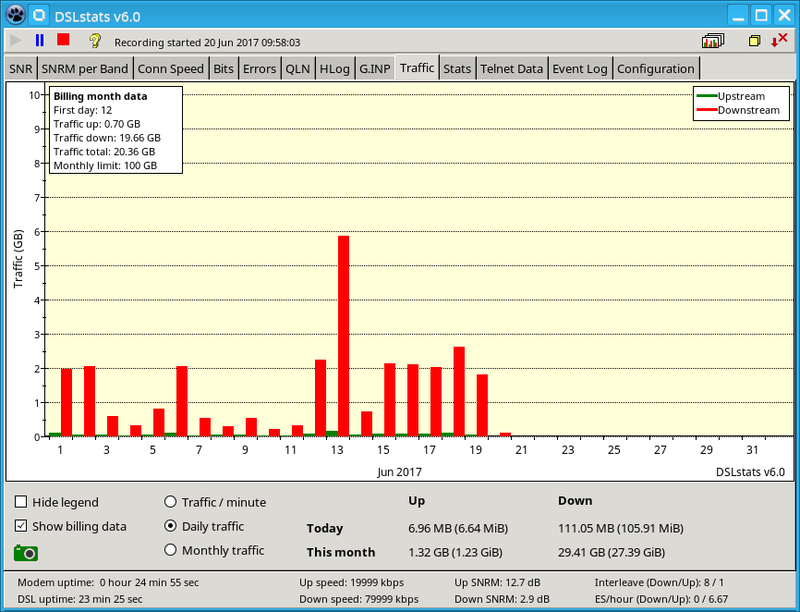 This group of charts plots the daily and monthly upload and download totals, and a scrolling graph of traffic per minute. The monthly chart can optionally display a usage limit, and the total of upload and download if that's what the usage limit applies to.